When I was a little girl, about 8, I had a friend who had been taught the rudiments of pattern-making and sewing by her mother. She was precocious, intense, and creative — and sent a fan letter to Priscilla of Boston, which at the time was among the country’s premier couture bridal boutiques. The directrice of Priscilla was so tickled by this letter, she directed her workroom to collect scraps and send them periodically to my friend. And thus magical boxes began to appear . . .
As you might imagine, these boxes were filled with beautiful fabrics and when one arrived Holly would set to making a collection of skirts, blouses, and dresses sized for dolls, priced at 5, 10 or 25 cents each. But the centerpiece of each collection was the 50 Cent Dress: the most elaborate garment, made of the choicest fabric in the box and finished with her best workmanship. To this day, I think of fancy dresses as 50 Cent Dresses. By this, I mean a dress that is a little too fancy for work. I think other people may call them party dresses or cocktail dresses. Unfortunately, I don’t need many party dresses. The entertaining my friends and I do is casual, and when I go to a concert or event, the dress is generally business attire. 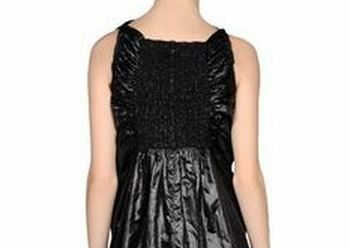 Nevertheless, it’s a good idea to have a dress on hand that can take you to a cocktail party, fancy fundraiser, or wedding, because when you really need such a dress, the right one can be maddeningly elusive. Therefore, I suggest that when you see a 50 Cent Dress that truly speaks to you, you snap it up . . . preferably on sale. I always have one eye on the lookout and spied these recently on YOOX. Jil Sander Navy: I bet this would be around knee-length on a woman of average height and it probably has a deep hem. Hi Julia — Thank you for sharing your memories! As a native of southern New Hampshire, Boston was “the city” of my youth and it remains to me the Most Glamorous City in the World. I was there just a few weeks ago, taking in a Red Sox game with my father and then having dinner outdoors on Boylston Street — such a treat. Ode to ladies who hailed from Boston . . . When I wed at the Boston Opera House in 2011, of course I hoped to purchase my dress from Priscilla’s. Oh, how the elegant and beautiful had fallen. Priscilla’s died a slow death (purchased by David’s Bridal, and then, ultimately, it closed forever). Thus, may I recommend Modern Trousseau as a little-known but highly customized designer? Perfect for the petite or curvaceous bride who wants a dress customized on a dozen measuring points instead of just a few. Betsy — I love it! As soon as Directrice Global Industries LLC gets its venture capital, I shall host an All Dressed Up with Nowhere to Go Party at some quasi-chic D.C. spot.